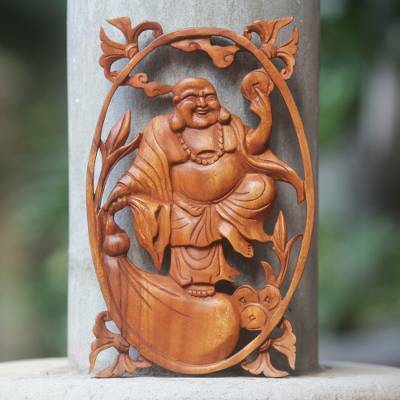 Chinese Style Happy Buddha Carved Wood Wall Panel, "Happy Buddha"
Balinese artisan Eka depicts Buddha in the Chinese style in this hand-carved suar wood wall panel. Rotund and mirthful, Buddha stands on a large sack of gold ingots, while holding Chinese coins in one hand. The piece is beautiful and the craftsmanship is very good and at a great price.